Acne is a skin condition which causes whiteheads, blackheads, and inflamed red lesions to form on the skin. Recalcitrant acne is a condition where acne does not respond to any of the common treatments. Acne is caused from an over production of oil (sebum). Sebum is produced by androgens, one of the hormones secreted by the ovaries, which also increases hair follicle production. Women with too much androgen, a condition called hyperandrogenism, can exhibit recalcitrant acne, truncal obesity, hair loss, hirsutism (excessive hairiness), infertility, polycystic ovaries (PCOs), and irregularities in menstrual cycle. 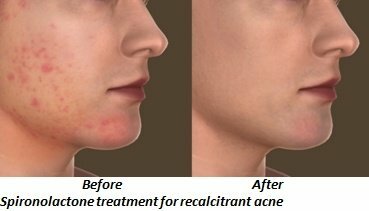 Recalcitrant acne can be treated with hormonal preparations such as estrogen, oral contraceptive pills, and low-dose glucocorticoids. 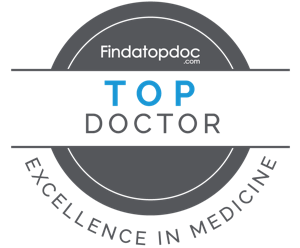 These hormones possess anti-androgenic characteristics and help in decreasing the production of androgen. Your dermatologist may recommend treating your symptoms with Spironolactone if hormonal preparations are unsuccessful in resolving your symptoms. Spironolactone has been widely used for over 50 years to treat fluid retention, mild high blood pressure, and a few rare hormonal problems. It was subsequently found to be highly effective in the treatment of certain hormonally-related conditions in women, including adult acne, unwanted facial or body hair, and pattern hair loss of the scalp. Spironolactone is used for treatment of acne in female patients who are resistant to any other treatment. It lowers the production and circulation of androgens which in turn reduces the follicle and sebum production. Spironolactone acts as anti-androgen where the androgen receptor is blocked and inhibits 5a-reductase enzyme activity in androgens. Spironolactone is taken regularly for 4 months to have a beneficial effect. If the result is effective, then it can be continued for 6 to 12 months. Spironolactone should not be used with drugs called angiotensin converting enzyme (ACE) inhibitors. If your blood pressure is normal, spironolactone will not affect it. If you are being treated for high blood pressure now, please tell Dr. Resnik as spironolactone may increase their effect. This drug is not safe for pregnant women and is not to be used by men as it can cause feminization. Also it is not prescribed for any patients with kidney related disorders. Potassium and salt contents in food, whole-grain cereals, chickpeas, potatoes, and bananas should be avoided. In women this treatment may cause irregularity in their menstrual cycle. Hence, spironolactone plus oral contraceptives such as OrthoTricyclin or OrthoCyclen is an excellent combination treatment for androgenic acne. If you have any questions or are looking for treatment please visit Resnik Skin Institute.